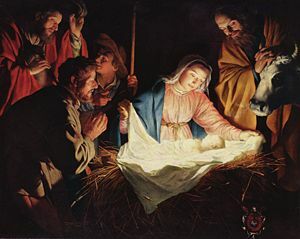 The Wise Men (Magi) adoring the infant Jesus. Epiphany (Greek: επιφάνεια, "appearance" or "manifestation") is a Christian feast intended to celebrate the "shining forth" or revelation of God to mankind in human form, in the person of Jesus. The feast is also called Twelfth Day, as it is the twelfth day after Christmas. In western Christian tradition, January 6 is celebrated as Epiphany. It goes by other names in various church traditions. In Hispanic and Latin culture, as well as some places in Europe, it is known as Three Kings’ Day. Because of differences in church calendars, mainly between the Eastern Orthodox and the western Catholic and Protestant traditions, both Christmas and Epiphany have been observed at different times in the past. Some Greek Orthodox churches and related traditions (e.g., Russian and Serbian Orthodox) celebrate Epiphany as the Theophany on January 19. Epiphany is the climax of the Advent/Christmas Season and the Twelve Days of Christmas, which are usually counted from the evening of December 25 until the morning of January 6, which is the Twelfth Day. In following this older custom of counting the days beginning at sundown, the evening of January 5 is the Twelfth Night. In traditional Christian churches Christmas, as well as Easter, it is celebrated as a period of time, a season of the church year, rather than just a day. The Season of Christmas begins with the First Sunday of Advent, marked by expectation and anticipation, and concludes with Epiphany, which looks ahead to the mission of the church to the world in light of the Nativity. The one or two Sundays between Christmas Day and Epiphany are sometimes called Christmastide. For many Protestant church traditions, the season of Epiphany extends from January 6 until Ash Wednesday, which begins the season of Lent leading to Easter. Depending on the timing of Easter, this includes from four to nine Sundays. Other traditions, especially the Roman Catholic tradition, observe Epiphany as a single day, with the Sundays following Epiphany counted as Ordinary Time. In some western traditions, the last Sunday of Epiphany is celebrated as Transfiguration Sunday. The earliest references to Epiphany in Christian literature indicate it as a celebration of Jesus' birth. The observance of Epiphany had its origins in the Eastern Christian churches, and was originally a general celebration of the Incarnation of Jesus Christ, and included the commemoration of: his birth; the visit of the Magi in Bethlehem; all of Jesus' childhood events, up to and including his baptism in the Jordan by John the Baptist; and even the miracle at the Wedding of Cana in Galilee. However, Jesus' baptism was the event predominantly commemorated. The date of the feast was very early fixed on January 6. The earliest reference to Epiphany as a Christian feast was in the year 361, by Ammianus Marcellinus. Epiphanius of Salamis says that the January 6 is hemera genethlion toutestin epiphanion (Christ's "Birthday; that is, His Epiphany"). In 385, the pilgrim Egeria describes a celebration in Jerusalem and Bethlehem on January 6 that obviously commemorates the Nativity of Christ. In a sermon delivered on December 25, 380, St. Gregory of Nazianzus refers to the day as ta theophania ("the Theophany") saying expressly that it is a day commemorating he hagia tou Christou gennesis ("the holy nativity of Christ"). In this tradition the baptism of Christ was celebrated separately from the Epiphany. However, this was not the case everywhere. Saint John Cassian says that even in his time (beginning of the fifth century) the Egyptian monasteries still celebrated the Nativity and Baptism together on January 6. The Armenian Apostolic Church still continues to celebrate January 6 as the only commemoration of the Nativity. Epiphany is celebrated by both the Eastern and Western Churches, but a major difference between them is over precisely which historical events the feast commemorates. For Western Christians, the feast primarily commemorates the coming of the Magi, while in the East the feast celebrates the baptism of Christ in the Jordan. However, in both cases the essence of the feast is the same: the manifestation of Christ to the world (whether as an infant or in the Jordan), and the Mystery of the Incarnation. By the year 534 the Western church had separated the celebration of the nativity of Christ into the feast of Christmas and set its date as December 25, reserving January 6 as a commemoration of the coming of the Magi. The West generally acknowledges a 12-day festival, starting on December 25, and ending on January 5, known as Christmastide or the twelve days of Christmas, although some Christian cultures, especially those of Latin America and some in Europe extend it to as many as 40 days, ending on Candlemas (February 2). On the Feast of the Epiphany, the priest, wearing white vestments, will bless the Epiphany Water, frankincense, gold, and chalk. The chalk is used to write the initials of the three magi over the doors of churches and homes. Not only do the letters stand for the initials of the Magi (traditionally named Caspar, Melchior and Balthasar), but of the phrase Christus mansionem benedicat, which translates as "may Christ bless the house." Prior to the reforms of 1970, (and prior to 1976 in the Anglican churches) the Roman Catholic Church celebrated Epiphany as an eight-day feast beginning on January 6 and continuing through the Octave of Epiphany, or January 13. Many continue to use this calendar, celebrating the feast of the Holy Family on the Sunday within the octave. 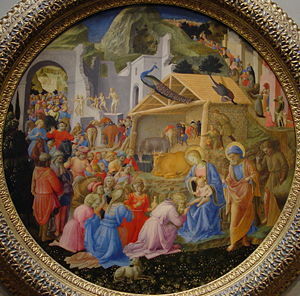 More recently, many Americans mark Epiphany on the Sunday after the first Saturday in January, and most Roman Catholics in the United States (along with many Protestants) now formally end the Christmas season with the Baptism of the Lord, after which the first period of Ordinary Time begins. Since 2007, the Roman Catholic Church in England and Wales celebrates the Epiphany on the Sunday closest to January 6. In the Church of England, the Epiphany is classified as a Principal Feast and is observed on January 6 or on the Sunday between January 2 and 8. There is also an Epiphany season, observed between the season of Christmas and the first period of Ordinary Time. It begins at Evening Prayer on the Eve of the Epiphany and ends at Evening Prayer (or Night Prayer) on the Feast of the Presentation (which may be celebrated on February 2, or the Sunday between January 28 and February 3). Eastern Orthodox icon depicting the baptism of Jesus. Usually called the Feast of Theophany (Greek: Θεοφάνεια, "God shining forth" or "divine manifestation"), the holiday is one of the Great Feasts of the liturgical year, being third in rank, behind only Pascha (Easter) and Pentecost in importance. Orthodox Christians celebrate Epiphany on January 6 (the date of January 6 on the Julian Calendar used by most Orthodox, but falls on January 19 of the modern Gregorian Calendar). Today in Eastern Orthodox churches, the emphasis at this feast is on the shining forth and revelation of Jesus Christ as the Messiah and second person of the Holy Trinity at the time of his baptism. It is also celebrated because, according to tradition, the baptism of Jesus marked the only occasion when all three persons of the Trinity manifested their physical presence simultaneously to humanity: God the Father by speaking through the clouds, God the Son being baptized in the river, and God the Holy Spirit in the shape of a dove descending from heaven. Thus, the holy day is considered to be a Trinitarian feast. The Orthodox Churches perform the Great Blessing of the Waters on Theophany. The blessing is normally done twice: once on the eve of the feast—usually at a font inside the church—and then again on the day of the feast outdoors at a body of water. Following the Divine Liturgy, the clergy and people go in a Cross procession to the nearest body of water, be it a beach, harbor, quay, river, lake, swimming pool, water depot, etc., and after a short ceremony the priest will bless the waters. In the Greek practice, he does this by casting a cross into the water. If swimming is feasible on the spot, any number of volunteers may brave the cold winter waters and try to recover the cross. The person who gets the cross first swims back and returns it to the priest, who then delivers a special blessing to the swimmer and their household. The water that is blessed on this day is known as "Theophany Water" and is taken home by the faithful, and used with prayer as a blessing. People will not only bless themselves and their homes by sprinkling with Theophany Water, but will also drink it. The Orthodox Church teaches that Theophany Water differs from regular Holy Water in that with Theophany Water, the very nature of the water is changed and becomes incorrupt, a miracle attested to as early as St. John Chrysostom. House Blessings: On Theophany the priest will begin making the round of the parishioner's homes to bless them. He will perform a short prayer service in each home, and then go through the entire house, gardens and outside-buildings, blessing them with the newly blessed Theophany Water, while all sing the Troparion and Kontakion of the feast. The Feast of Theophany is followed by an eight-day festival on which the normal fasting laws are suspended. The Saturday and Sunday after Theophany have special readings assigned to them, which relate to the Temptation of Christ and to penance and perseverance in the Christian struggle. There is thus a liturgical continuum between the Feast of Theophany and Great Lent. A priest is holding a Tabot in a Timket (Epiphany) ceremony at Gondar, Ethiopia, at which water will be blessed. 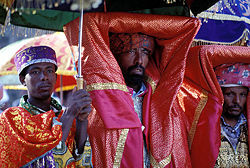 In the Ethiopian Orthodox Church, the feast is known as Timkat and is celebrated on January 19 (or January 20, if that year is a Leap Year according to the Ethiopian calendar). The celebration of this feast features a Blessing of Waters and solemn processions with the sacred Tabot. In the Armenian Church, January 6 is celebrated as the Nativity (Sourp Dznount) and Theophany of Christ. The feast is preceded by a seven-day fast. On the eve of the feast, the Divine Liturgy is celebrated. This Liturgy is referred to as the Jrakaloutz Badarak (the Eucharist of the lighting of the lamps) in honor of the manifestation of Jesus as the Son of God. This Liturgy is followed by a Blessing of Waters, during which the cross is immersed in the water, symbolizing Jesus' descent into the Jordan, and holy muron (chrism) poured in, symbolic of the descent of the Holy Spirit upon Jesus. The next morning, after the liturgy, the cross is removed from the vessel of Holy Water and all come forward to kiss the cross and partake of the blessed water. In Rome, "Epiphania" was transformed through mispronunciation into Befana, the great fair held at that season, when sigillaria of terracotta or baked pastry were sold (Macrobius I, x, xxiv; II, xlix). La Befana is a character in Italian folklore, similar to Santa Claus. In some European cultures, the greenery put up at Christmas is taken down at Epiphany, in other cultures it remains up until the Meeting of the Lord (February 2). The Irish call this day Little Christmas or "Women's Christmas" (Irish: Nollaig na mBan). The Dutch call this day Driekoningendag (Three Kings' Day). In France, on Epiphany people eat the gâteau des Rois in Provence or the galette des Rois in the northern half of France and Belgium. This is a kind of king cake, with a trinket or a bean hidden inside. The person who gets the piece of cake with the trinket becomes "king" for a year. In Spain, Mexico, Cuba, Puerto Rico, and some other Latin American countries Epiphany day is called El Día de los Reyes (The Day of the Kings). In Spanish tradition, on the day of January 6, Melchiore, Caspar, and Balthazar—representing Europe, Arabia, and Africa—arrived on horse, camel, and elephant, bringing respectively gold, frankincense, and myrrh to the baby Jesus. In Spain, Argentina, and Uruguay, children (and many adults) polish and leave their shoes ready for the Kings' presents before they go to bed on January 5. Sweet wine, nibbles, fruit, and milk are left for the kings and their camels. In Mexico, it is traditional for children to leave their shoes on the eve of January 6 by the family nativity scene or by their beds. Also a letter with toy requests is left and sometimes the shoes are filled with hay for the camels, so that the kings will be generous with their gifts. In Puerto Rico, it is traditional for children to fill a box with grass or hay and put it underneath their bed, for the same reasons. In some parts of northern Mexico the shoes are left under the Christmas tree with a letter to the Three Kings. This is analogous to children leaving mince pies or cookies and milk out for Father Christmas in Western Europe. In the afternoon or evening of the same day, the ritual of the Rosca de Reyes is shared with family and friends. The Rosca is a type of sweet-bread made with orange blossom water and butter, and decorated with candied fruit. Baked inside is a small doll representing the baby Jesus. The person who finds the doll in his piece of rosca must throw a party on February 2, "Candelaria Day," offering tamales and atole (a hot sweet drink thickened with corn flour) to the guests. In Spain, the bread is known as Roscón; made with the same items, traditionally the roscón was simply a round sweetbread with candied fruit on top, however, recently, different flavored whipped creams are used as filling. 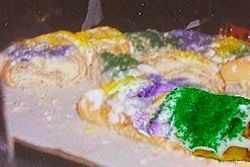 In Louisiana, Epiphany is the beginning of the Mardi Gras season, during which it is customary to bake King Cakes, similar to the Rosca mentioned above. The one who finds the doll (or bean) must provide the next king cake. The interval between Epiphany and Mardi Gras is sometimes known as "king cake season." 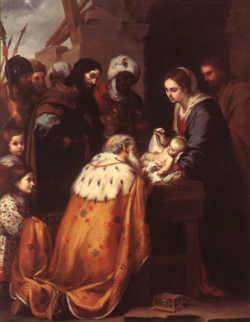 Catholic Encyclopedia: – Epiphany. www.newadvent.org. This page was last modified on 19 August 2017, at 16:35.